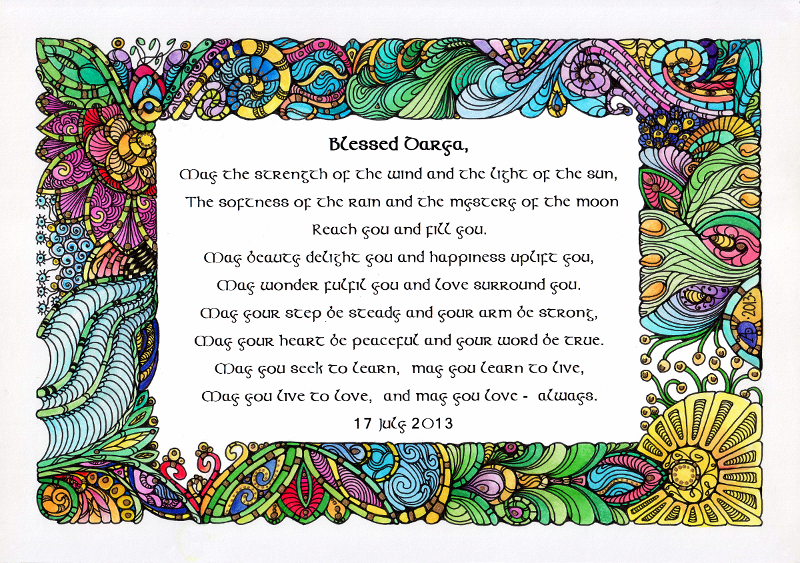 I was contacted by Darya’s mum asking if I’d ‘do a blessing in the style of your cards’. This is what I did. It’s approx A4 in size. 6″ x 8″ (15cm x 20cm). Sharpie and rotring pens, Caran d’Ache watersoluble pencils with water wash and metallic paints and inks on heavy cartridge paper. The colouring has taken most of yesterday and another 3 hours today and it’s now done. That’s the name of this piece of art just finished. Approx A4 in size, various media, including permanent marker pens, Inktense pencils with a water wash, metallic inks and water colour paints on heavy cartridge paper.